Taking care of your oral health is important to prevent various problems including gingivitis, tooth decay and bad breath. There are different products that you can use to maintain your oral health including dental floss, mouthwash, toothpaste and toothbrush. Aside from manual and sonic toothbrush, ultrasound toothbrushes are also available. An ultrasound or ultrasonic toothbrush is an electric toothbrush that uses ultrasound for removing bacteria on teeth and gums. There are three different kinds of sounds. They are subsonic, sonic and ultrasound. Subsonic sounds are sounds that cannot be heard by human ears, while sonic sounds are sounds that can be heard by ears. Ultrasound on the other hand has higher frequency. The FDA approved the use of ultrasound on toothbrushes with the frequency of 1.6 megahertz or 6 billion hertz. This frequency is therapeutic and is just right to kill bacteria in the mouth. This helps thoroughly clean your teeth without damaging your gums and enamel. Ultrasound toothbrushes may be more expensive than manual and sonic toothbrushes. However, they are worth the price considering the benefits that you can get from them. As mentioned, this type of toothbrush uses ultrasound with the frequency of 1.6 megahertz, which can clean the teeth and gums without actually touching them. The frequency is enough to remove bacteria in your mouth and break them into pieces. There is no need to move the toothbrush back and forth or in circular motion. It should just be drawn across the teeth, as well as the gums to cover all area. This is beneficial especially to those who are having difficulties moving their hands, those who do not like the feel of brush on their teeth, gums or tongue, people with sensitivity, as well as those who have certain conditions that prevent them from using abrasive toothbrushes. Is Ultrasound Toothbrush Better Than Manual and Sonic Toothbrush? Ultrasound toothbrushes may cost more than manual and sonic brushes. However, they are proven more effective than the other types of toothbrush. So if you want to enjoy the benefits of an ultrasound toothbrush and you can afford to buy one, it is best to have one purchased. Electric sonic toothbrush cleans the teeth through vibration. Like manual toothbrush, it can only remove bacteria on the areas that it reaches. Bacteria from areas that are not reached will remain. With ultrasound, frequency is used to remove bacteria without touching the teeth and gums, making it more effective. Just make sure that you draw the brush across all areas of the mouth and it will remove bacteria even on those hard to reach spots. How to Determine if It Is a Real Ultrasound Toothbrush? Oscilloscopes are used to check the ultrasound and frequency created by toothbrushes. Manual toothbrushes do not have vibration and frequency. Sonic toothbrushes have vibration but do not have ultrasound. Ultrasound toothbrush uses vibration and ultrasound. When you check an oscilloscope, you will see that it creates ultrasound and vibration. To check if it is a real ultrasound toothbrush, you can set it to ultrasound mode where it doesn’t have vibration. When you check it on the oscilloscope, you should be able to see the ultrasound working. Sellers should be able to prove this to you. It is important to conduct this test before buying one since there are several products nowadays that claim they are ultrasound toothbrushes, when they are fakes. To ensure you get the benefits of an ultrasound toothbrush, make sure that you get the real deal. If you decided to purchase an ultrasound toothbrush, there are various features to look for to ensure that you are getting the best one in the market. Rechargeable – a rechargeable ultrasound toothbrush is better than one that uses replaceable batteries. This is because this can save you more money in the long run. Timer – find one that has a timer so you would know that you are spending the right and equal amount of time on all areas of the mouth, making sure that bacteria are removed thoroughly. Nano-Bubbles – get one that comes with this feature as this is more effective in keeping a healthy oral hygiene. Ultrasonic Chip – an ultrasound toothbrush that comes with an ultrasonic chip is a better option since it has better functionality. This entry was posted in Toothbrush and tagged Ultrasonic on July 21, 2013 by admin. Personal hygiene is an important step in protecting your health, as well as the people around you. This prevents various types of diseases that could be a result of poor hygiene. Furthermore, this makes you more presentable, thus giving you confidence. Brushing your teeth is one of the ways on how to maintain personal hygiene. According to the American Dental Association, it is recommended to brush your teeth at least two times a day for two minutes after a meal. Toothbrush should also be replaced after three months to stay effective. Brushing your teeth can prevent plague from building up, which could lead to tooth decay and tooth loss. Regular brushing of teeth can also prevent the development of bad breath. Whether you are using a manual or an electric toothbrush, the most important thing is that you are brushing your teeth properly to remove plague and bacteria. However, using an electric toothbrush also has some benefits especially for those who have arthritis or other conditions that make it difficult for them to brush their teeth well. It is easier to brush hard to reach areas, like under the gums, thus preventing gingivitis. According to studies, it also provides deeper cleaning. Furthermore, it has a larger handle than manual toothbrush, making it more convenient to hold. Electric toothbrushes have varying features. These are some of the things that you need to consider when choosing an electric toothbrush. Determine which of these features is most important to you. After all, every person has different needs and preferences when it comes to toothbrush. Aside from larger handles, electric toothbrushes also come with different head sizes so you can find one that perfectly fits your teeth and mouth. Most of these toothbrushes also come with a timer, which notifies you if you already spent two minutes brushing your teeth. Some would alarm after spending 30 seconds on a specific area so you can move on to the next. While there are electric toothbrushes that run on disposable batteries, most of the toothbrushes nowadays are rechargeable, which are more cost-effective since there is no need to keep changing batteries. Electric brushes come with sanitizer that prevents bacteria from building on the bristles. Most also have pressure sensor, which is important to prevent hurting your gums. This is very helpful especially for those with sensitive teeth and gums. There are different types of electric toothbrushes and they work slightly different from each other. Rotating – as the term suggests, the bristles of this type of toothbrush rotate or turn. It could be that the set of bristles rotate together in a circle or each of the tufts of bristles rotates separately. Rotating-oscillating – these toothbrushes have small and round heads, which rotate in one direction then to the other one. Counter-oscillating – these toothbrushes have tufts of bristles that rotate in different directions. Pulsing – these are types of rotating and rotating-oscillating electric toothbrushes with heads that move forward and backward. Side to side vibrating – as the term suggests, these types of toothbrushes move from side to side fast making them vibrate. Dual head – these electric toothbrushes have one part that moves from side to side and another part that rotates, combining the movement of two types of electric toothbrushes. Sonic and ultrasonic – these types of toothbrushes vibrate in high frequency and speed, which helps remove plagues better. If you decide to use an electric toothbrush, there are various things that you need to consider when purchasing one. This can help you find the best electric toothbrush that fits your budget and needs. Electric toothbrushes vary in prices. They can be as low as $8 to as high as $200. The more expensive ones offer more features. Your budget is one of the most important things to consider since you do not want to spend more than you can afford. Those that are from $50 and up usually have great features and quality. As mentioned, these electric toothbrushes have heads that come in different sizes. Find one that has the perfect size for your teeth. Furthermore, soft to medium bristles are better than hard ones since they are gentler on the gums and enamel. There are electric toothbrushes that come with replacement heads. These are great choices since you do not have to look for replacement heads when it’s time to change the head of your toothbrush. You may also get those that do not come with these replacement heads but just make sure that there are available heads with the size you need. You don’t want to end up buying a new toothbrush. Toothbrushes with timers are also a great choice. There are rechargeable batteries and there are also those with batteries that need to be replaced. While toothbrushes with rechargeable batteries are more expensive than those with disposable batteries, you can save more in the long run since you don’t have to keep on buying new batteries. If you have the budget, it’s recommended that you pick one that is rechargeable. Optimal cleaning performance is important in a toothbrush. Determine which of the types of electric toothbrushes is best for you. Also, find one that has sanitizer feature to prevent the build-up of bacteria on the bristles. Philips – is a Dutch multinational electronics company, which is one of the largest in the world. It is the manufacturer of Sonicare, which is an electric toothbrush that has a replaceable head vibrating hundreds of times per second. Oral-B – this is one of the most popular brands for oral hygiene products including mouthwash, toothpaste, dental floss and toothbrushes. Colgate – like Oral-B, this is also a famous brand for oral hygiene products like dental floss, mouthwashes, toothpastes and toothbrushes. Waterpik – this company develops quality personal and oral care products including toothbrushes, dental floss, shower heads and sinus products. Rio – is a brand that specializes on health, beauty and fitness products sold in different countries around the world. Electric toothbrushes come in different brands and models. Here are some of the best models that you can choose from. 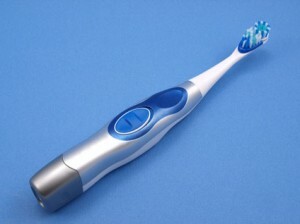 Oral-B 1000 – this is the newest model from Oral-B, which comes with a round head and better grip. It has a light indicator that tells you when to recharge. 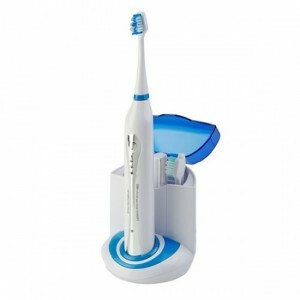 Oral B Precision – this model has advanced bristles that clean teeth properly, removing plagues better. Plus, they are not hard on the gums. Oral B Pulsonic Electric Toothbrush – it has a small head with better grip and gentle vibration. The charger can also be mounted on the wall, preventing clutter. Oral-B Vitality – this is a rotating-oscillating type of electric toothbrush allowing you to clean even those hard to reach areas. Sonicare FlexCare – it has smaller head and soft bristles that gently but thoroughly clean teeth making it safe on the gums and enamel. This entry was posted in Toothbrush on July 21, 2013 by admin.